AMIC-5000 tester is designed to measure insulation resistance of power cables, transformers, motors and other electrically powered devices. 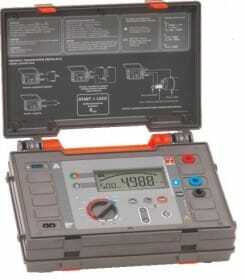 Additionally the device allows for measurement of AC and DC voltages. Input circuits of the measuring devices are electronically protected from overloading, e.g. due to incorrect connection to the circuit being tested or incorrect use of input terminals.